Apart from watching much less anime these days than I used to, I also tend to watch trash. Trash is relaxing, enjoyable and brainless. If it’s not trash, it’s mostly light shounen fare that’s only slightly above trash, or sequels to series I began ages ago. Beyond that, well, what have I watched recently and finished? There are a couple of shows I haven’t quite finished yet, but discounting those, probably nothing since Boku dakega Inai Machi, over a year ago. So this show was if anything a pleasant contrast to the rest of my anime fare. And very enjoyable it was too: a supernatural story with a slow pace, strong characters, a British setting and some really iconic visuals. It put me in mind of several strong series – Natsume Yuujincho, for the whimsical feeling and the supernatural influence on everyday life, only the introverted main character who attracts supernatural beings and slowly opens up thanks to getting close to them is female rather than male, and the mythology is British rather than Japanese. Kuroshitsuji for the British setting and strong but dark deuteragonist, only with less abrasive humour and without that unpleasant taste in the mouth recent manga chapters of that series have left me with. And Fullmetal Alchemist, for the physical presence of the deuteragonist, snappy but tasteful humorous style changes and strong supporting cast. Pretty impressive company to be in. 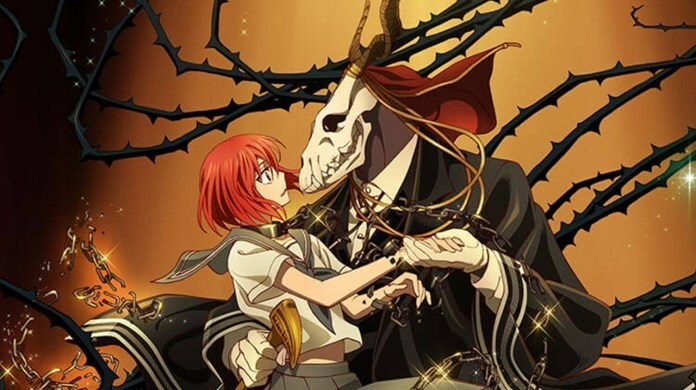 Mahoutsukai no Yome follows a young Japanese woman called Chise has a difficult and traumatic childhood, compounded by terrifying experiences with supernatural beings (expanded in the rather slow OVA prelude episodes), as she sells herself into slavery and is bought by Elias, a strange combination of fairy and human who appears like a huge man wearing the skull of a wolf with the horns of a ram. A pretty fantastic design. Elias buys Chise for two reasons – because he wants to understand humanity better, and because she is a sleigh beggy, which in this world is not a little fairy from the Isle of Man, but a kind of human spiritual conduit, able to draw magic from all around it and from within. The show has a rather charming approach to British folklore and culture that occasionally shows fantastic research and precision (I used to feed ducks at that exact spot in Regent’s Park!) and sometimes just makes up its own systems or seems to take vaguely British images and throw them together in what seems right to a Japanese sensibility (was that…fish and chips served as a side dish to a proper meal in an upper middle-class household?!). The episode titles are taken from what seems to be a very dated book of British idioms (I doubt anyone has said ‘What is bred in the bone will not [come] out of the flesh’ in a hundred years, especially when we have ‘The apple never falls far from the tree’). But uneven as it may be, it’s always a thrill to see England represented in anime, whether it’s K-On girls running around Camden or aerial battles between dolls in Rozen Maiden, or even the first arc of JoJo’s Bizarre Adventure. They don’t have to get every detail right, and it’s always enjoyable to see things like Anteros at Piccadilly Circus made the location of an exciting climactic showdown. There’s some fun mythological elements, too – Shakespeare seems to have been heavily referenced, for we not only get Titania and Oberon as king and queen of the fairies, but a helpful little spirit called Ariel. Otherwise, we have a cute Selkie – though not as cute as the one in Song of the Sea – and of course some mighty dragons who are unless they lose control somewhat less fearsome than the ones in Arthurian or Christian mythology. Probably the most interesting element of Western mythology is the use of the Cartaphilius character. Thankfully the term is never used, but this is the Wandering Jew, who was cursed by Christ never to die in response to jeers on the way to Golgotha. I don’t know whether the mangaka changed this to ‘The Wandering Sorcerer’ for politically correct reasons or simply thought the audience wouldn’t understand if the term was left unchanged, but either way he generally goes by the names Cartaphilius or Joseph, two names that have been given to the legendary figure over the years. The show creates a new an interesting backstory for the character, implying there was an original cursed figure and that Joseph was an (adorable) innocent whose body and identity were essentially stolen while the memories and suffering remained, but he is the primary antagonist, is capable of extreme cruelty and yet still evokes sympathy. An intriguing and compelling enemy, I wonder if we’ll see more of him in the future and whether he’ll be properly punished for what he’ll do. The characters may forget his crimes, but there was one scene where the voice-over, delivered by a very sweet-sounding seiyuu, was pretty devastating to hear. One of the darkest moments in anime I’ve seen since Bokurano, and rather surprising from what was a generally pretty safe and harmless anime – excepting where Cartaphilius was concerned. Well-made, well-acted, pleasant to look at, intriguing conceptually and occasionally emotionally resonant, I really enjoyed this show and want to see more. I believe it was quite a hit, and certainly the visual impression Elias makes will stick with most people, so hopefully we’ll see a fair bit more.